Nicholas J. Clough and James McGinty, Orbital Gas Systems, USA, introduce an alternative way of measuring pipeline gas properties. Natural gas that enters into or moves between networks must be metered for volume and calorific value (CV). Since countries have national regulations in place for the provision of natural gas, appropriate levels of accuracy in CV measurement must be maintained. Traditionally, gas chromatographs (GC) have been used and approved for this purpose, calculating CV from full compositional analysis (ISO 6976). Separation of the sample gas into individual components within a GC takes several minutes to complete, meaning that a full analysis is slow, with accuracy depending on regular and expensive calibration, as well as ongoing maintenance. Historically, this slow response was not a problem when gas quality in networks was relatively stable. However, recently, several countries have experienced a significant shift from utilising a single source of indigenous natural gas, towards multiple sources of gas from new interconnector pipelines, shipped LNG and unconventional gas, such as biomethane. Many countries are now net importers of natural gas, which has resulted in greater variation in gas quality within networks. The GasPT® gas properties transmitter is a fast response inferential CV determining device, which has been developed to provide accurate and rapid measurement of gas properties. With this transmitter, users can monitor and accurately meter both transmission and distribution gas pipes with varying gas quality. The device measures speed of sound, thermal conductivity and carbon dioxide. ISO 6976, an international standard, then used to calculate the gas sample CV. In addition to gross and net CV output, the GasPT gas properties transmitter also provides outputs of gas compressibility, density and several other natural gas parameters. The transmitter’s sensor units have been integrated with Orbital’s VE Technology sample probe and gas conditioning to provide high pressure gas sampling, filtering, preheating, pressure and flow control. The integrated analysis (GasPTi) compiles a sample cycle from probe tip to data output in less than 10 sec. The hydrocarbon equivalence that is built into the GasPTi inferencing mechanism ensures that the higher hydrocarbons C4+ are accounted for in the composition. The advantages of GasPTi over traditional GC include fast response, low cost of installation and ongoing costs, ease of installation and use, no field calibration required, very low maintenance and no requirement for carrier gas. These benefits can also convert into the other advantages for the operator, including lower purchase price, as well as reduced footprint, civil works, technician visits and gas emissions. The tool that is used for the abovementioned alternative can be mounted directly on the pipeline sample probe (Figure 1) to minimise sample tubing length and lag time. Alternatively, a post mounted system can be provided and installed alongside the pipeline if there is an existing sampling point. The post mounted option can be configured with a retractable probe if the pipeline operator needs to withdraw the sample probe from the pipeline for maintenance or online inspection activities. If a gas test is required to validate the GasPTi, a sample gas bottle can be incorporated into the enclosure and test validation can be operated remotely. Highly accurate gas analysis is pointless without having satisfactory gas sampling and conditioning prior to the analyser. Long gas sample lines contain threaded fittings, areas of stagnant gas (dead legs) and potential for condensate formation, all of which alter the composition or identity of the sample gas. Ideally, gas sample lines should be short, contain as few fittings and components as possible and should not have any areas of expansion or reduction in volume where recirculation could cause stagnant gas build up. When designing and developing VE Technology, these problems were taken into consideration and addressed. Helical strakes on the external surface of the sample probes reduce the vortex shedding effect and eliminate probe vibration. An aerodynamic probe tip prevents the formation of aerosols and reduces the entrainment of particulates into the sample line. Total electropolishing of all internal wetted surface areas (including fittings and components) prevents chemical and physical interaction altering fresh sample gas. In addition to the probe, the principles of VE Technology have been incorporated into a gas conditioning system (a VE conditioning unit and analyser interface module), which provides gas filtering to 0.4 μm, gas preheating prior to pressure reduction with flow and pressure control prior to gas sample supply to an analyser. Gas sample preheating is required to ensure that there is no liquid dropout during the pressure reduction (associated with the Joule Thomson Effect), as this alters the sample identity. Pressure is controlled in the form of a backpressure regulator, which is situated in a fast flow loop outside of the live sample pathway, in order to minimise components in the live gas sample flow path. For metering installations, the International Organisation of Legal Metrology (OIML) has over 60 member states worldwide, including 27 European countries, and recommends a Class A instrument with CV error of less than 0.5% (approximately 0.2 MJ/m3). The American Gas Association Report No.5 is widely used across North America, the Far East and the Middle East, which also recommends a CV uncertainty level of less than 0.5%. GasPTi has approval from the NMi under recommendations of the European OIML R 140 ‘Measuring systems for gaseous fuel’ as a Class A instrument for CV measurement. There are several areas of uncertainty that should be considered when metering natural gas in high pressure pipelines. The GasPTi is a simple option that does not require calibration or carrier gases and can be mounted directly on a pipeline without additional housings on the plant, thus requiring little equipment compared to GC. This gives a very fast response of typically less than 10 sec. for a T90 step change from sample probe tip to data output. This compares with several minutes response time for a traditional GC installation. Independent uncertainty analysis has shown GasPTi to be more accurate than traditional GCs over a timed period with changing CV conditions.1 Over time, this will convert into significant performance improvements for the GasPTi, as can be seen in Table 1. This is based on four months of real CV data from a UK gas network and shows the GC with a much slower cycle time that results in RMS errors up to three times that of GasPTi. Figure 1. GasPTi mounted on a pipeline. The slow response of traditional GC means that further errors can occur on the metering system. A volumetric flowmeter, such as an ultrasonic or turbine meter, will output data almost instantaneously. However, the delay of several minutes in gas analysis by the GC means that there is a mismatch in the CV data. If flow or CV are changing rapidly, there will be errors in the overall energy flow accounting. Volume correction could be affected as the calculation in density and compressibility will also be mismatched with the flow data. Finally, there are ultrasonic meters that use the gas composition to calculate and cross-check the sample gas speed of sound and this could be mismatched. 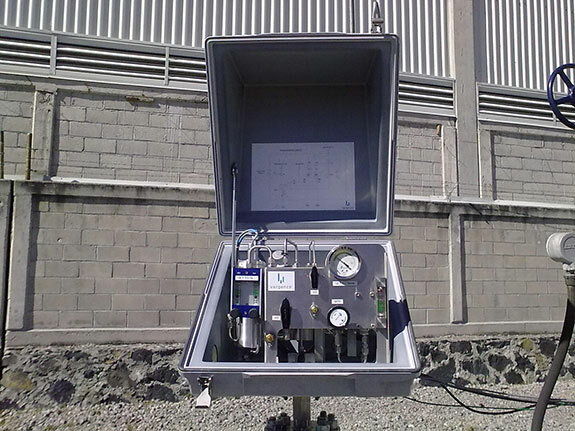 The GasPTi gas properties transmitter has many advantages for metering systems on high pressure gas pipelines, including natural gas transmission lines. While traditional GC analysers may have issues with speed of response when gas quality varies in the pipeline, GasPTi with VE Technology provides continuous gas sampling, conditioning and analysis to give rapid and accurate CV data without the need for carrier gas or calibration gas. GasPTi will provide a gas composition, which can be fed to a flow computer if required or will calculate all the gas physical properties from ISO 6976 in the same way as a GC. This modern solution has met performance criteria set by international standards (European OIML R140 and US AGA Report No.5) and safety standards (ATEX, IECEx and CSA) for use in Zone 1 hazardous areas. It is a lower cost solution than GCs for online gas quality CV measurement, which can be deployed more widely for fiscal metering systems across gas transmission and distribution networks and for custody transfer on downstream end use. DNV GL Technical Note 15896, ‘GasPT Measurement Error Dependence on Measurement Frequency’, 2014.